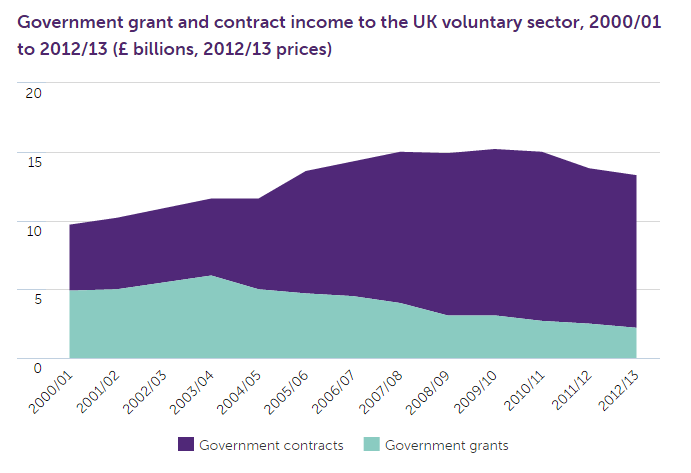 NCVO's Civil Society Almanac 2015 shows a rapid decline in grant-making to charities of over 60% over the last decade. NCVO’s Civil Society Almanac 2015 shows a rapid decline in the level of grants given by public bodies to the voluntary sector, dropping from a high of £6 billion in 2003 to £2.2 billion in 2013. At the same time we see a significant increase in the level of contract-making suggesting that government is opting for this method of procurement casting doubt over the future of grant-making.